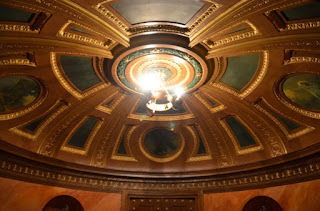 I wrote a short piece last week on my From Labor To Refreshment... blog about an exhibit that was about to open at Eastern Illinois University entitled Freemasons in Central Illinois. The exhibit was part of a class project, and a few months ago I was called upon to offer a little background information on the subject of Freemasonry to a couple of the students in that class, Chase Driskell and Bailee Julick, who were involved in researching and putting together the exhibit--so I was anxious to see what they came up with. So Greg Knott and I decided to take a drive to Charleston (IL) and meet up with Michael Shirley at the opening reception (Michael teaches history at EIU and was also involved in the project). I'm not sure what I expected, in fact, Greg asked me on the way down. In truth, I expected a couple display cases in the library--maybe an apron, a fez, and a couple Masonic lapel pins. What we found when we arrived at the Booth Library was truly remarkable. We weren't talking about a class project as I had interpreted that to mean. What we found was a very extensive museum-quality exhibition. See what I mean about location? And you know what they say in real estate? Location, location, location! EIU couldn't have found a better space for the exhibit to be displayed. The Booth Library looks like a medieval castle--in fact, I remarked that the building looked like it could have been designed and built by Freemasons. 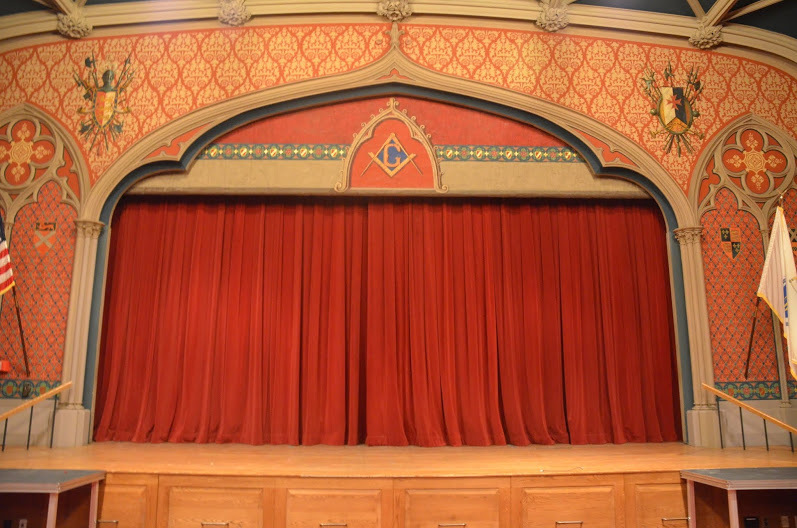 It was the perfect setting for a Freemasonry exhibit. There were numerous displays, each on a different area of Freemasonry. There was a large case in the foyer that outlined in broad terms the scope of the entire exhibition. There were a number of remarkable pieces on display there--the most stunning of those pieces was a Demolay robe. There was another case that talked about perceptions and misconceptions about Freemasonry--it even had a movie poster from National Treasure with the prominent all-seeing eye as part of the poster design. Considering how broad the subject is, the exhibition did a great job touching on various aspects of the Fraternity, and breaking it down for the uninitiated into easily digestible pieces. Famous Masons? Where do you suppose that idea came from? There was a display about Prince Hall Masonry. There was a display that outlined all the appendant bodies of Freemasonry--York Rite, Scottish Rite, Shrine, etc. 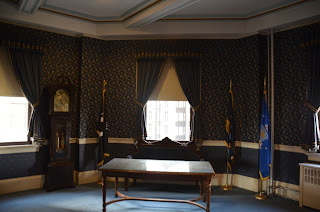 And smaller displays that went into Masonic symbolism and even talked about some of the Masonic traditions--like the purpose and meaning of the Masonic apron. But the most impressive part was the collection of Masonic artifacts--a number of individuals and lodges loaned pieces for display. There were Knights Templar swords and antique uniform pieces, Scottish Rite caps, rings, jewels, rods, a couple beautiful antique aprons, old photos, a very old altar set (Bible, square and compass)--and yes, that Shriner's fez (which belonged to Michael Shirley). It was very impressive how many items they'd collected. And there was a display on how the students put everything together with photographs showing how the pieces were cleaned and prepared for display by students wearing latex gloves--now that did make me smile. It's true, they had some old antiques there, and they should be treated carefully. And they had obviously been well trained in handling old museum pieces. What I thought was funny, is that many of those items in the display cases, when not on exhibition, are probably still in use by the lodges that loaned them. That's one of the things about being such a tradition-based organization--we don't store our antiques display cases, we actually continue to use them decade after decade after decade. A very good example of this is the Washington Bible. The Bible that George Washington was sworn into office on was borrowed from a Masonic Lodge, and it is still in possession of that Masonic Lodge. 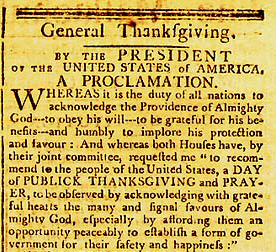 Newly-elected Presidents to this day still have the choice of using the Washington Bible when they are sworn into office--and several have. But the students were really the most impressive part for me--they had really learned their subject well, and had obviously enjoyed working on the exhibition a great deal. And it showed. One thing that I heard repeated several times, was just how much there was to Freemasonry. One of their greatest challenges was defining what they were going to explore in their exhibition. One of the students said she could fill an entire museum on the subject of Freemasonry alone. I told her there are entire museums, and libraries too, dedicated solely to the subject of Freemasonry--quite a few actually. 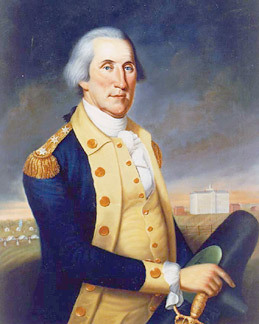 Probably the best-known of these is the George Washington Masonic Memorial in Washington, D.C. A memorial and museum supported by all 50 United States Grand Lodges. We met all the students and were told of their contributions to the exhibition at the reception--two of the students had marketing/design experience (which I think really showed in the exhibition). And the students were also treated to an unexpected surprise--Past Grand Master of Illinois A.F. & A.M. Noel C. Dicks had been interviewed several times by the students working on the exhibition, and was on hand to offer a few congratulatory remarks. He was obviously very impressed with the final product as we all were. Congratulations to the students and thank you so much for all your hard work: Nicholas Collins, Alexander Hamilton, Alyse Bennett, Stephanie Templin, Bailee Julick, Marisela Luna, Emily Scarbrough, Mark Stanford, Lashanna McGahee, Amy Wywialowski, and Chase Driskell. And the EIU staff involved: Bev Cruse, Stacey Knight-Davis, Philip Mohr, and Donna Nichols. And the Freemasons involved: Michael Shirley (also served as Project Curator), Noel Dicks, Ryan D'Arcy, William Jones, Frank Lincoln, Marc Wilson, and Todd Creason. And for those that loaned items for display: Coles County Historical Society, Library of Congress, Alex Gillespie, Frank Lincoln, Michael Shirley, Tuscola Lodge, Charleston Lodge, Villa Grove/Camargo Lodge, Westfield Lodge, and our Grand Lodge A.F. & A.M. of Illinois. And very special thanks also to Dr. Debra A. Reid for putting together such a terrific curriculum for her students. "The Freemasons in Central Illinois" exhibition will be on display at the Booth Library at Eastern Illinois University until January 18th. If you are in the area, I strongly suggest you pay the library a visit. In the 1962 Indiana Senatorial campaign, young Democratic upstart Birch Bayh went up against the venerable Republican incumbent Homer E. Capehart, in a relatively conservative state where young Bayh's chances were not seen as very good. The two candidates, Masonic Brothers, went after each other in a brutal campaign that was too close to predict right down to the bitter end. Toward the end of the race, Bayh's campaign staff came up with new words to a little ditty from a 1960 Broadway show starring Lucille Ball, Wildcat. The song was Hey, Look Me Over. And so on. According to one Hoosier who was there to hear it, "You simply could not get the song out of your head, and could not turn on a radio or TV without hearing it." There were a lot of factors that led to Birch Bayh winning by the slimmest of margins in 1962... Bayh's charisma, President Kennedy's support, Capehart coming across like a fuddy duddy and more, but there are analysts who give that song most of the credit. Time reported, "After the Indiana populace heard [the song] for the 22,356th time in the autumn of 1962, Birch Bayh went to Washington." 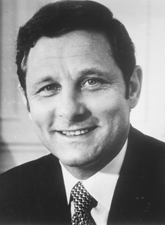 Brother Birch Bayh went on to a stellar career in the US Senate and was briefly, in 1976, considered a front-runner for the Democratic Presidential nomination. When the 1968 Senatorial campaign rolled around, Bayh ran for re-election and Hoosiers braced their ears to hear that successful campaign song over and over. But Bayh's campaign jingle, which had proven so successful, was never heard again. Why? With the song still in copyright the Republicans, badly burned by it six years earlier, bought the rights to the tune and quietly put it on the shelf. Despite having his theme song silenced Brother Bayh won the election and eventually served 18 years in the US Senate. 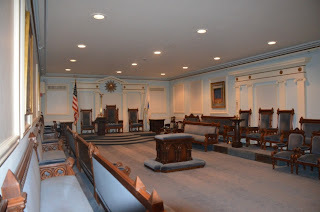 We continue our journey on the Freedom Trail by finishing our visit to the Boston Masonic Building. Previously we visited the first 3 floors and now we continue upward. Tuscan Hall resides on the 4th floor. This is a smaller lodge room with a green décor and a magnificent sunburst over the Masters Chair. The York Rite Bodies and Harvard and MIT Lodges all have offices on this floor. The 5th floor contains to lodge rooms, Doric and Ionic as well as a new amazing Chamber of Reflection. The Doric Lodge room is themed in light blue and is the smaller of the two lodge rooms on this floor. I especially enjoyed this room for its intimate size yet elegant furnishings. The Chamber of Reflection was an original design into the building but was recently renovated in 2008. This room was oval in shape with an amazing domed ceiling that contained paintings on it depicting Time, Death, War and Peace. 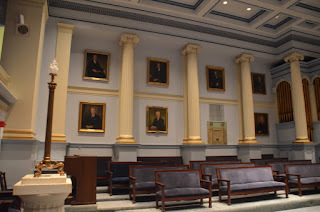 The Anteroom is located near Doric Hall and the Chamber of Reflection and is intended as a space for brethren to relax. It contains a large fireplace and a handsome grandfather clock. 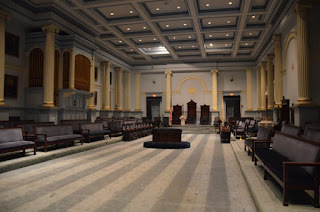 Ionic Hall is everything you would expect in a magnificent Grand Lodge building. It has a high ceiling with light embedded within the complex grid system. Portraits of the most recent Past Grand Masters adorn the walls between columns that support the room and add a sense of majesty to its visitors. 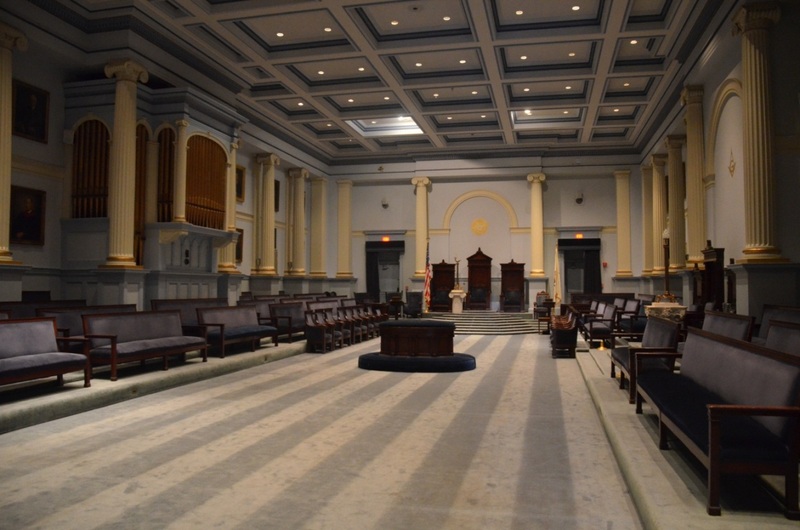 The East is no less impressive with a large overpowering Masters chair that sets the tone for the seriousness of Massachusetts Masonry. The 6th floor contains the Armory of Boston Commandery No. 2 and the office of the Superintendent of the building. I did not tour this floor. Floor 7 is home to Gothic Hall which is used primarily by the Valley of Boston Scottish Rite. 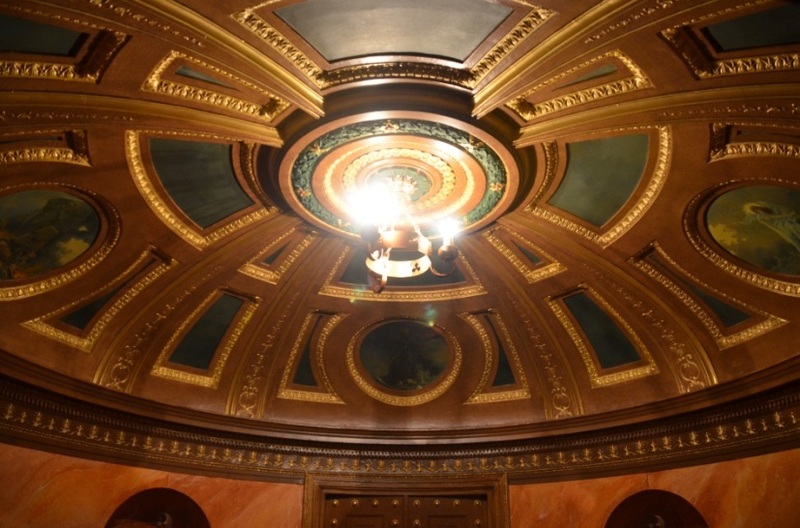 This hall is equally impressive with an amazing ceiling accented by a unique gold leaf border. 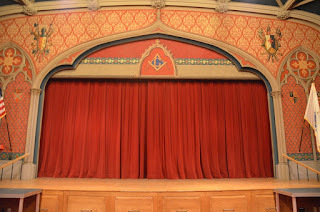 Gothic Hall contains a large stage that is used to put on the degrees of the Scottish Rite. Our next stop on the Freedom Trail will be the Granary Burying Ground. Not long ago, Brother Vanderhoef’s (Van for short) wife became ill. I had visited her in the hospital and brought a card and some flowers. Van thanked me of course and some considerable time had passed. She was sent home and then back to the hospital several times due to complications. Van would leave his loving bride at home briefly to make appearances at our stated meetings and degree work. He worked so hard at dividing his time. It didn’t take a genius to see that Brother Van was down in spirits, but stormed on through everything he could, providing care for his wife until the day she passed, not long ago. There was no doubt that countless Brothers attended her service, where Brother Van performed her service himself as it was his duty. Flash forward a month or two and we come to my Blue Lodges annual installation of officers. Brother Van looked to be in better spirits, almost as if he knew his wife was at peace and now so could he. In fact at one point that night, he asked me to remove my tie because he wanted me to wear the traditional bow tie. When the Mason of the year for the state of Illinois asks you to take off your tie, well, you do it. He then proceeded to tie an extra bow tie on me, since I didn't know how.When the installation of officers was over, as customary in our lodge, each installed officer stands up and introduces his family. Several Brothers had family present, including myself. I introduced my wife, brother-in law, sister-in law, niece, nephew, three friends, father-in law and his lady. Applauds after each. When it came time for Brother Van, our installed Chaplain to introduce his family, he stood up slowly turned to the crowd and waved his hand over all the Brethren and said “This is my family.” The applause was amazing. I think if he had been the last one to speak there would have been a standing ovation. Brother Van’s statement was so unique and simple I think it made everyone realize that to a point, that was true for all of us. For a lifetime of service, for being a mentor, a gentleman, a brother and an inspiration, whether he ever reads this or not, I know I speak for so many when I say, thank you brother Van. Sir Knight Robert Johnson, 32° is a Freemason out of the First North-East District of Illinois. He belongs to Waukegan Lodge No. 78. He is also a member of the York Rite bodies Royal Arch, Cryptic Council and Knights Templar, and a member of the Scottish Rite Valley of Chicago. Brother Johnson currently produces and hosts a weekly Podcast (internet radio program) Whence Came You? which focuses on topics relating to Freemasonry. In addition, he produces video shorts focusing on driving interest in the Fraternity and writes original Masonic papers from time to time. He is a husband and father of three. He works full time in the safety industry and is also a photographer on the side as well as an avid home brewer. 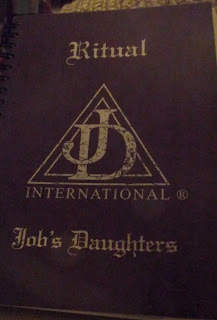 He is also working on two books, one is of a Masonic nature. Courage is what it takes to stand in front of three judges and recite your ritual work that you have been memorizing for competition. So for the past six weeks or so, our bethel has been practicing every Tuesday for the big day. We even went through a mock competition. I am very proud of not just my bethel but every young lady that competed. Oh the results…our bethel came home with a 1st place in Novice (she had to know the Proficiency work and secret work), 2nd place for Sr Princess (she sits in the East) 2nd place for 5th Messenger and 3rd place for team(they told the story of Job). We have members that have never been to competition, so this was an experience for them and I hope they continue to compete. I am proud of them no matter how they placed. And special thanks to Jerry Starks- Excellent Grand Royal Arch Captain of the Grand Royal Arch Chapter of the State of Illinois. He came to one of our practices and gave the girls pointers on diction and delivery. The girls and the adults enjoyed it very much. Matter of fact, Empire lodge was practicing as well, and they thought he was there for their practice. He said, "No, I am here for the girls." 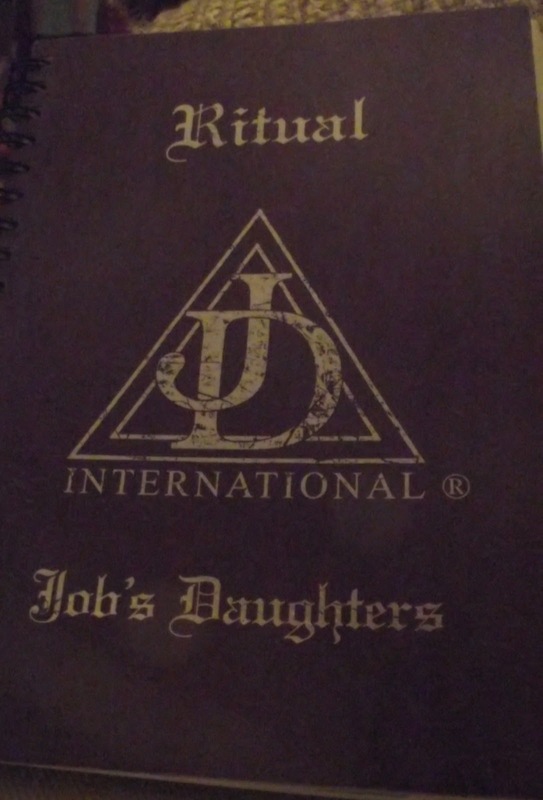 I am offering a challenge to each of you Masons, please come to a Job’s Daughter’s meeting near you and see their beautiful ritual work. You would be amazed. originally posted 8/24/12 on From Labor To Refreshment . . .
Yup, a century later it's still there. Back in the olden days, Masons didn't always build their own meeting places. Local Masonic Lodges met in a lot of different places. They might meet in a member's home, a warehouse, or even a barn or carriage house. It might be a different place each month. And it was very common for them to meet in rooms they rented over a public house--or as we like to say today, a tavern. And, of course, after the meeting, you might imagine where the members might adjourn too. That wasn't always a good thing for the early reputation of Freemasonry, but there are a lot of examples of that. At some point, Masons got tired of not having a permanent home, and probably got tired of paying rent to the taverns they met in, so they began building their own lodges. Of course, the question was--how are we going to pay for it, and how are we going to sustain it? That's when the entrepreneurial spirit of Freemasonry kicked in--we've always had that resource. We have always had the reputation of attracting very industrious members. The solution to that problem may go back to how they began--meeting in rented rooms over public houses. Who knows who did it first--but at some point, Masons realized it was better to be the landlord than the tenant. There are probably tens of thousands of examples that demonstrate this still in existence today. Masons built their lodges on the second floor, usually in a commercial area of town, and rented out the first floor to the local mercantile merchant, barkeep, restaurant, or apothecary. The first picture that accompanies this article I took myself--it's a good example. It's St. Joseph Lodge No. 970 (IL). They have a beautiful lodge upstairs, and two retail stores below. It was built in 1914. A few miles away, there's another example, built about the same time--doing business out of the first floor of that lodge is the local post office, an insurance agency, and out the back of the building, a trucking company. The rent goes to the lodge--it helps pay the insurance, utilities, and upkeep on the building, and what's left is used, along with the dues that Masons pay, and all those pancake breakfasts and spaghetti dinners, to support the causes that Masons believe are important. 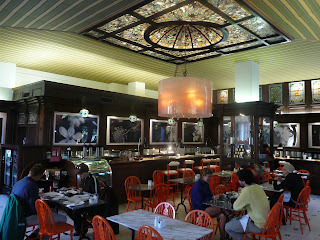 I've written about a few of these places in my novels--in my novel One Last Shot, my protagonist, Levi Garvey used to visit the Gryphon Tea Room, when he lived in Savannah, Georgia, and mentioned that right upstairs was the place where he became a Mason. Now that's fiction, but both of those places are real. I've been there. 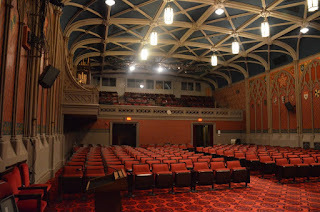 I've had tea at the Gryphon, and toured the Savannah Scottish Rite Temple--while I was still an Entered Apprentice myself. In my second novel A Shot After Midnight, one of these 100-year-old lodges in a small town was being restored in the background of the main story--that was based on a true story as well. 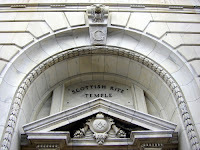 Savannah Scottish Rite Temple entrance. 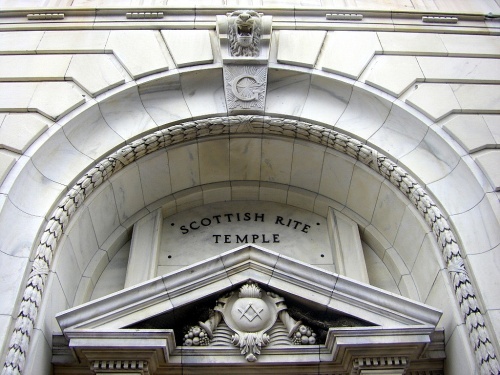 ﻿ Masons have always been builders, but not in the way you might think. Sure, we've built many grand buildings, but that is a result of our main goal. 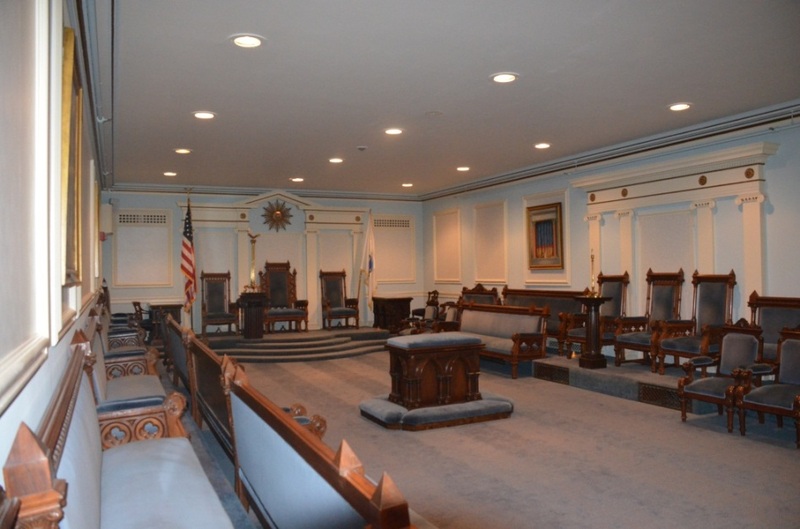 Long before it was common for young men to attend college, Masonic Lodges were places of learning. Members learned how to become a better man--a better husband, a better father, a better member of society. 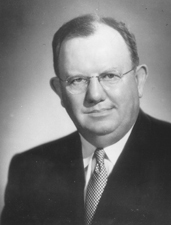 And it was one of the few places available for many young men to learn about leadership--and there are few colleges to this day that do a better job teaching that subject than Masonic Lodges do, because when done correctly, it's not a four year leadership course, it takes at least twice that. And while that learning was going on upstairs, the rented space downstairs often housed businesses that helped build the communities they were in. These simple buildings and the men that met there, and businesses that hung their shingle on Main Street were often the incubator for towns, cities and villages that are still around today. There has always been a entrepreneurial spirit to Freemasonry. We're builders. We start one man at a time. And those men, the more famous of which I have so often profiled in my books, build strong communities, businesses, get involved in government, the military, entertainment, they write, they create music, they contribute their unique talents to the greater good, and each, in their own way, make the world a better place to live. And even as impressive as some of the individual accomplishments may be, the Fraternity itself has become a force in making lives better--there are many examples today, but the most readily identifiable is the Shriner's Hospitals. But that's just one. Every single day, Masons raise over 1 million for numerious charities. That's an impressive number. But I still believe the most important contribution Freemasonry makes in the world starts with that prime directive--to make good men better. It certainly changed my life. Everything Freemasonry has been able to accomplish beyond that is the result of taking a good man, and showing him what he is capable of. Freemasons have played the most successful game of small ball in world history, because it starts with a strong grip that raises a single man at a time. And it's what he does, and not what we do that makes it work. It is the cumulative result of this effort that has made us strong. If you doubt me--look for the signs of Freemasonry around you. I guarantee it is there whether you are in the big city, or a small town. You need only look for it. And when you find it--take a picture of it, and send it to me. With your help, and your stories, I'm going to talk about his more. It could have been any town, anywhere. Where it was doesn’t matter. It was just a new town to me, interesting but unfamiliar. On Saturday, my wife, Carolyn, and I drove around this new place. Among other things, we discovered a beautiful, ornate church. We decided to attend the next morning. The following day we put on, as they say, our Sunday finest and headed for the church. It was a wonderful old building, made of limestone with carvings and gizmos everywhere. We stayed outside for a while, walked around it, admired it. Inside, everything was new to us, but somehow familiar, comfortable. The greeters were quick to recognize us as visitors and just as quick to welcome us as if we were old friends. 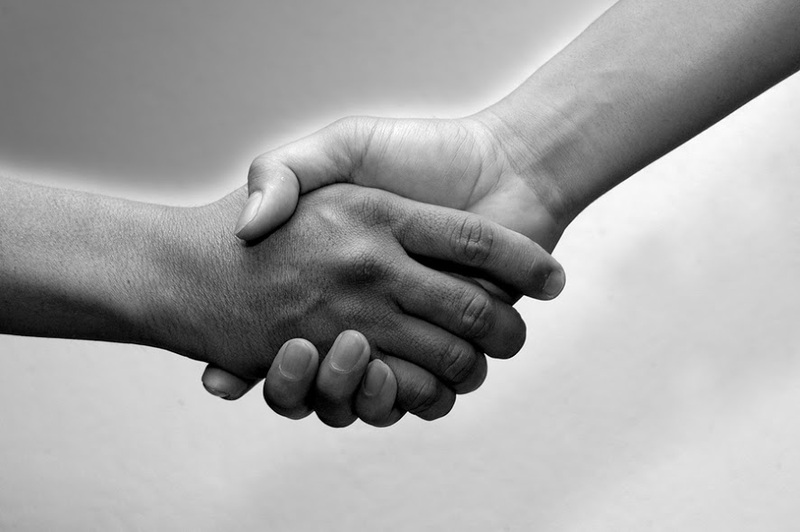 We shook hands, talked and smiled. They walked us down the hall and into the sanctuary. As I entered, a colossal pipe organ, too large, too magnificent for this small, unfamiliar town filled my field of vision. The breathtaking organ gazed down upon old elaborate pews. On top of everything else, the sanctuary was filled with Christmas decorations. Garland hung from the rafters. Stars twinkled. A manger flanked a huge over-decorated Christmas tree. This was a House of God. Carolyn and I slid into our seats. We shared more smiles and handshakes with people around us. The choir boomed, announcing the start of the service. We sang. We prayed. We greeted each other. We listened. In a quiet moment, I sat back and simply admired the place. Suddenly, while I was soaking it all in, I felt something hit my right shoulder. I looked aside and out of the corner of my eye I saw a hand. I moved back for a better view and saw the hand was holding a piece of paper. I took the paper, opened it and read. On the back of the note I told him all about me, my wife was named Carolyn, my Lodge, I was in the officers’ line, I knew the “Letter G” and Second Degree Charge. I handed the note back to him. In a few minutes, here it came again. Did I know so-and-so? Why were we in town? I answered his questions and asked a little bit about him. 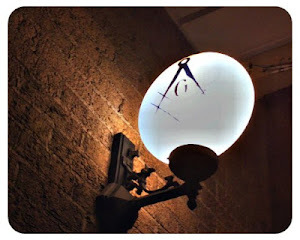 There we sat, two grown men, in this magnificent House of God, in this inspiring service, passing notes like a couple of grade school kids – and becoming friends, all because of a simple square and compasses pin and the bond, the brotherhood it signified. When you are a Mason, in the company of Masons, there are no strangers.